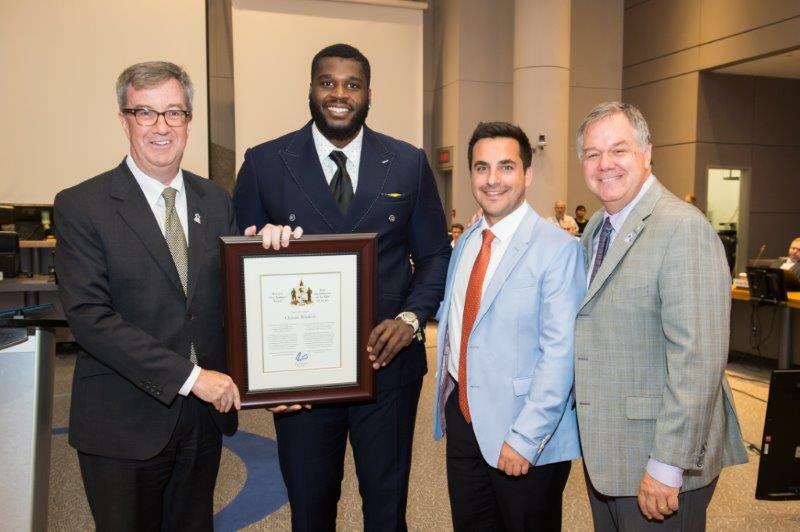 Ottawa – Mayor Jim Watson, Gloucester-South Nepean Ward Councillor Michael Qaqish and Alta Vista Ward Councillor Jean Cloutier presented the Mayor’s City Builder Award at City Council today to Christo Bilukidi. Christo Bilukidi was born in Angola and lived in France and Brazil before his family settled in Ottawa. He attended and played football for Georgia State University on a scholarship, and later played in the National Football League for the Oakland Raiders, Cincinnati Bengals and Baltimore Ravens. When the six foot five, 300-plus-pound, defensive lineman left the NFL last August, after four seasons in the League, he just wanted to come back home, where he knew he could find happiness both in his heart and in his head. A few months ago, Bilukidi became an ambassador for Ottawa Community Housing and is excited about the role. Getting involved in the community is important to him. In his work with Community Housing, he is having an impact on youth — something that makes his mom, Juliana, proud, but is also important to him. He now runs a summer camp for OCH youth with the help of the CFL’s Ottawa Redblacks. He also has a love for fashion, which has not only translated into a business, with his men’s clothing line, Idlewood Bespoke, but a great way to give back to the community, by participating in OCH Arts Camps where he has the chance to discuss fashion and entrepreneurship with kids of all ages. He shares with the youth that coming from a low-income area shouldn’t discourage them from succeeding in life. Bilukidi’s conversations with kids go much deeper than just football; he is there to talk about anything that may be on their minds. For these reasons, Christo is glad to be back in the place he calls home.